Does your child love the ‘Pink Panther Show’? 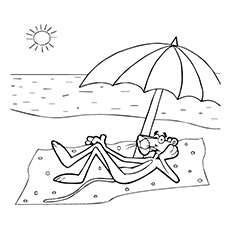 Are you looking for some Pink Panther coloring sheets to keep him occupied this summer vacation? Then you’ve come to the right place. We have come up with some coloring sheets that your kid is sure to love. The favorite panther of all times has now made its way into the children’s coloring sheets and is available for you to print out. 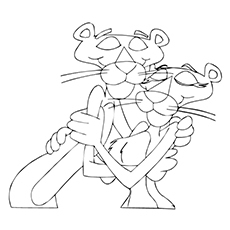 Here is a small collection of Pink Panther coloring pages to print in different moods and poses. The collection also includes some characters from this series. Here is the logo of the cartoon series ‘The Pink Panther’. The Pink Panther is a cartoon cat with the manners of an English aristocrat. He becomes angry when humans or gadgets try to disrupt his existence. In most of the cartoons, he falls into stressful situations, yet makes the most out of it. The Pink Panther is the titular character of the ‘Pink Panther’ series. 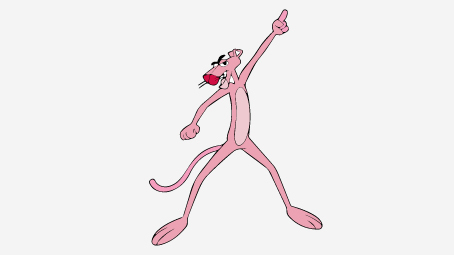 He is a tall and thin, pink colored panther with small, circular ears. He has expressive black eyes, yellow eyeballs, and a large, purple colored triangular nose. He has a long, snakelike tail and a lean body. 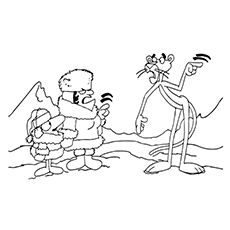 The Little Man is the primary antagonist of the ‘Pink Panther’ cartoon series. His name is the Big Nose in the Pink Panther films. 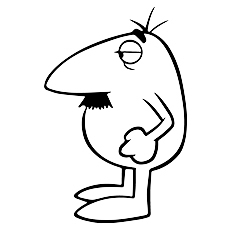 The Little Man, as the name suggests, is a tiny man with a big nose sticking out from his face. He is the archenemy of Pink Panther. He has a white dog that helps him to get rid of the Pink Panther. Get your child a head start with mathematics with this coloring sheet. Tell him to join the numbers from 1 to 46 to reveal the image. He is sure to hone his fine motor skills as he connects the numbers. Your child can then color the panther in any shade he likes, not just pink. 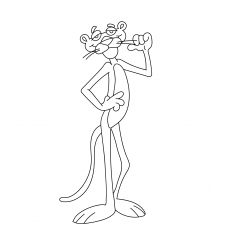 This is one of the coolest pink panther coloring pages free to print, featuring the sophisticated image of the Pink Panther. Don’t you think he looks dapper all suited up? You can have your child combine several colors for this picture. It will look fabulous hung on your son’s room. Inspector Clouseau is the deuteragonist of the ‘Pink Panther’ series. This clumsy man is the chief inspector of the police. 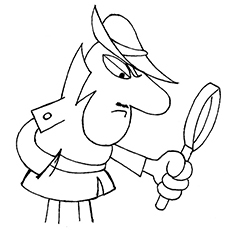 Most of the investigations of Clouseau are useless. He always gets into trouble because of his clumsiness. Nevertheless, he finds the culprits and solves the cases successfully, all by accident. 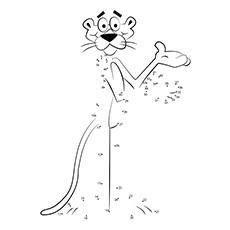 Here is a cut coloring sheet of Pink Panther with his beloved. The scene is from the series ‘The Pink Panther in: Pink at First Sight’. ‘The Pink Panther in: Pink at First Sight’ was a Valentine’s Day special series. In the cartoon, the elegant cat had no money except for the seven cents. He then finds a job as the messenger on the Valentine’s Day. The antics of the job land him to meet the Pantheress of his dream, his ideal Valentine. Have your child color in the cute picture of baby panther playing with his toys. You can also ask your kindergartener color this image while thinking a story to go with it. Here is a coloring sheet of Inspector Clouseau and his gendarme, Sergeant Deux-Deux interrogating the Pink Panther. The duo works together to fight the villains from various parts of the world. The elegant Pink Panther is having fun in the sun. Tell your child to brighten up this summer scene by adding a splash of color. Why don’t you consider taking your child for a trip to the nearby beach this summer? These free printable Pink Panther coloring pages will improve your kid’s creativity in arts. So why are you waiting? 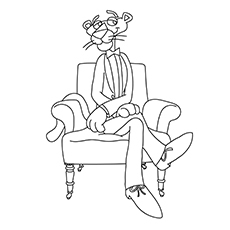 Print out these Pink Panther colouring pages and see your children have a blast with them. Do not forget to share your kid’s creativity with us.